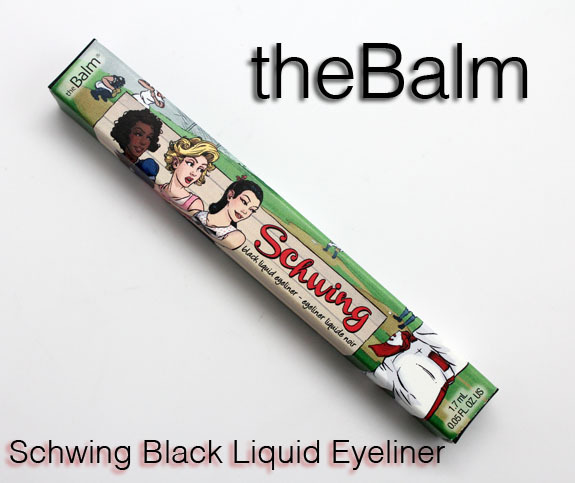 theBalm Schwing Black Liquid Eyeliner isn’t just a great liner, but it comes in such cute packaging! I think theBalm has some of THE best packaging of any brand out there. I love the retro artwork. Oh and the fact that they’re a local company (San Francisco) makes me extra happy. 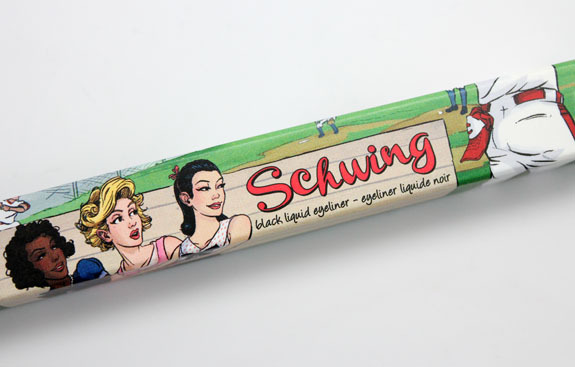 Schwing is a jet black liquid eyeliner. 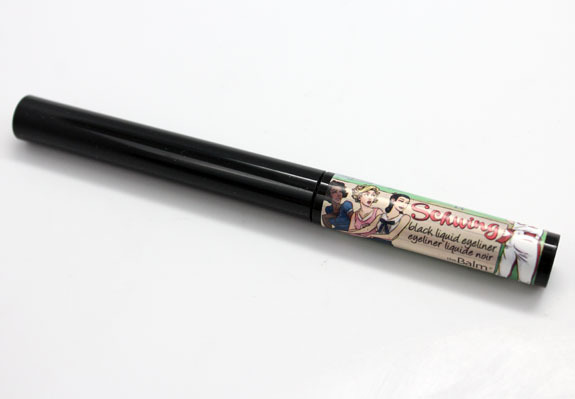 It comes in a pen-style with a soft felt-tipped applicator. It has a pointy tapered tip and is thinner than some similar ones, which I like. That way you can get a super thin liner easier, or a thicker one if you please by pressing down a bit harder. The color is a true jet black matte, and it dries fairly quickly and without bleeding. Pricing: $17.00 for 0.05 oz. 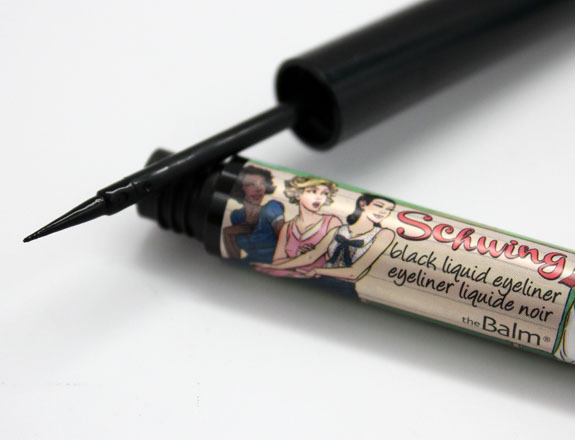 Are you in the market for a nice black liquid liner? Note: theBalm is cruelty free. I wish they made these in different colors! I rarely wear black liner. I love this brand! Adding this to my list of eyeliners to try. LOL I love that packaging! 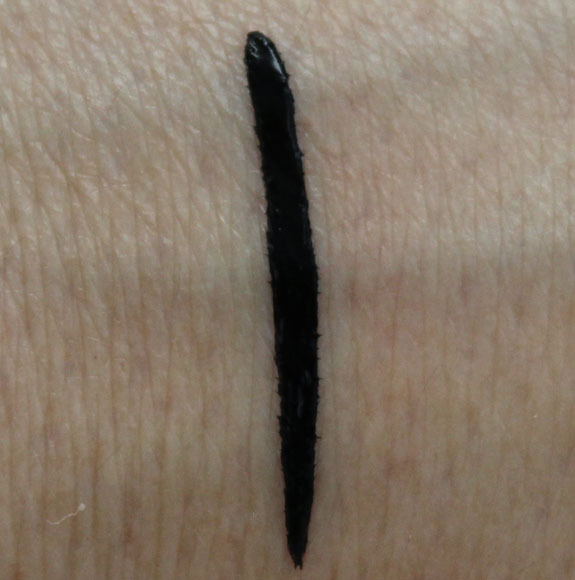 I like a good liquid liner, but I don’t know how I’ll like this type of applicator. I prefer the ones that are more like real pens if you know what I mean! Now that is black! I love TheBalm’s pressed powder, I’m gonna have to check out some of their other stuff! and yeah, the packaging is really attractive! Don’t think it is, but once it’s dry, it’s dry. So it won’t smudge unless it gets wet. that’s great! thanks for the answer! Ooh, I love how dark that is! The name literally made me laugh out loud. I dont have any Balm products, but their packaging rocks my socks. I probably don’t need this particular product at the moment, but I should further check out the brand! I like the cheeky packaging. I am so going to buy this. My L’Oreal liquid eyeliner dried up and is ashy and gray now. I love theBalm. I e-mailed them to ask for the ingredients and they wrote right back. In case you are wondering. Nice short list, nothing scary. TheBalm is such a great brand. I love their eyeshadows and I love their cheeky attitude. I wasn’t aware of this liner but I’m glad to know about it. I haven’t tried this yet but am very interested. My biggest issue with liquid eyeliners is after I have applied it and let it dry…. I then curl my lashes and that’s when I notice lots of the liner has come off and is on my eye lash curler. Have you had this happen with this one?